A precision printer for technical documents, the Canon ImagePROGRAF iPF810 is a must have for those in need of a high quality hardware for their complex full colour renderings, ECAD, MCAD, and CAD drawings, and GIS maps. The Canon ImagePROGRAF iPF810 is a premier printing solution boasting exceptional line accuracy – an essential component for quality technical printing. 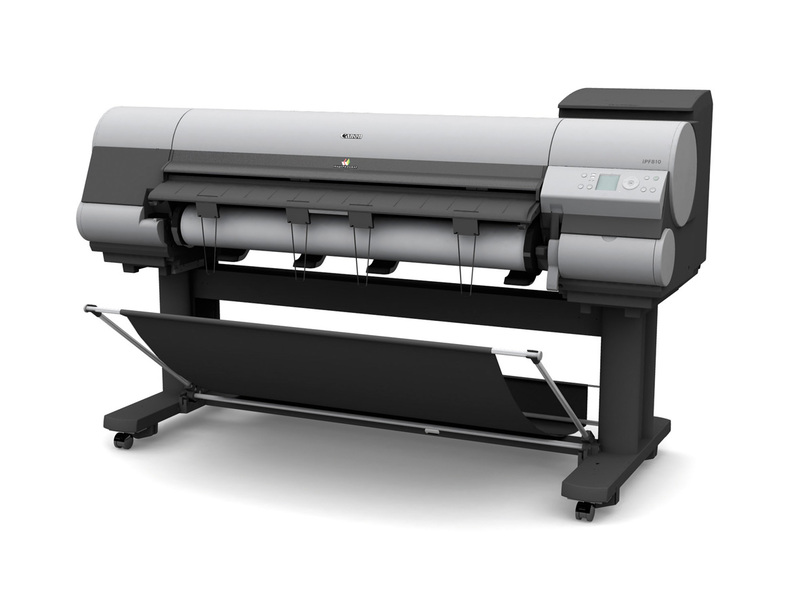 It features on-board support for HP RTL and HP GL/2 files, and produces large format output while keeping the finest detail is speedy and effortless, making it the ideal in particularly demanding settings. However, Mac OS X users may find it challenging to use. Staying true to Canon's compact design, the Canon ImagePROGRAF iPF810 measures 45.1x74.6x50.9" and is sturdily built for full blast printing jobs. It is designed to handle multiple complex tasks, with its 80GB hard drive (suitable for shared printer environments). Standard interfaces include high speed USB and Ethernet connections, plus optional Firewire (IEE 1394). It is relatively quiet, producing only 52 dB or less during operation. In addition to its multitasking capabilities, the Canon ImagePROGRAF iPF810 allows relieving workload, storage, and retrieval of print jobs with just one touch of a button. It provides the option of a remote interface and password protected mailboxes, so users don't have to stand up and feed information to the printer. The Canon's ever reliable Economy Print Mode also helps lower the cost per print. To ensure continuous printing, the Canon ImagePROGRAF iPF810 has a sub-ink-tank system that lessens interruptions. Purchase the high-capacity stacker for higher paper print yield; it provides a flat surface to unload prints. It can also automatically pick up documents of mixed sizes and stack them up (as many as 300 sheets), so users don't have to wait for their prints to finish. Designed for technical printing, the Canon ImagePROGRAF iPF810 does not support Adobe PostScript. That's bad news for Mac OS X users, who will have to use applications other than QuarkXpress and Adobe Illustrator. The printer uses the brand's proprietary printing language, GARO. The USB cable does not come with the package, either, although this is not a major drawback.